This year's 911 Carrera is available in several different model types: including the 2012 Porsche 911 Carrera 4 GTS (with a starting MSRP of $112,000), the 2012 Porsche 911 Carrera GTS (with a starting MSRP of $103,100), the 2012 Porsche 911 Carrera Black Edition (with a starting MSRP of $81,300), the 2012 Porsche 911 Carrera 4 (with a starting MSRP of $85,400), the standard 2012 Porsche 911 Carrera coupe (with a starting price of $79,000), the 2012 Porsche 911 Carrera S (with a starting price of $91,900), and the 2012 Porsche 911 Carrera 4S (with a starting price of $98,300). There's also a mid-year redesign of the Carrera S (with a starting price of $96,400) and a Cabriolet (convertible) variant of several of the 911 Carrera models. The 2012 911 Carrera 4 GTS coupe, which we will focus on in this review, also comes in Cabriolet form. There are also several Turbo and Targa variants. 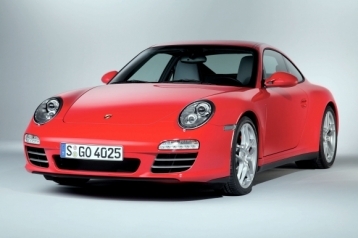 The 2012 Porsche 911 Carrera 4 GTS coupe features 23 horsepower above the 911 Carrera 4S due to a 3.8-liter flat-six engine, which delivers 408 horsepower. It has an amazing top track speed of 187mph and a zero-to-sixty time of only 4.4 seconds. This time shortens to 4.2 seconds with the optional PDK seven-speed transmission (which also inflates the price from $110,200 to $114,520). Safety features are plentiful and include several airbags, Porsche Side Impact Protection, an immobilizer and alarm system, LED and Bi-Xenon taillights and headlights, and optional Porsche Ceramic Composite Brakes. Technology and comfort features are also ample and include: leather sport seating and a sport steering wheel, rain-sensing windshield wipers, heated exterior mirrors, cruise control, HomeLink (garage door system), and Bluetooth. Optional features include: navigation with voice control, a Bose audio system, XM Satellite Radio, and a 6-Disc CD/DVD Changer.